c'est la peau en tant qu'il le connaît. Paul Valéry, "L'Idée Fixe, La Pléiade", OEuvres II, Paris 1931, pp. 215-6. The European Association for Architectural Education (EAAE-AEEA) Subnetwork on Architectural Theory, bringing together a wide group of architectural pedagogists working collaboratively on the role and nature of architecture theory in schools of architecture, gathered in Chania in the summer of 2010, in order to focus on the collateral relations between digital/material and depth/surface. In that seminal meeting, the group, invited by Ctrl_Space  Lab founders Yannis Zavoleas and Nikolas Patsavos, the Center for Mediterranean Architecture (KAM-CMA) and the Department of Architecture of the Technical University of Crete, were practically asked to capitalise the findings of its previous work sessions in Hasselt, Trondheim, Lisbon and Fribourg  by applying methods and concepts developed at those occasions as an interpretative critical tool within the context regarding the emergent digital architecture nature and its effects on education. The whole attempt was seen as an opportunity to revisit a field which, so far, had been often seen as something extraneous and contradictory, if not even hostile to the origins and the traditions of architecture; an attitude the group willed to also problematise and situate it within its relative context. There has been an important break in the polarity between depth and surface caused in contemporary architecture by the emergence of a new digital materiality and tactility. On a technical level, this is due to techniques of fabrication linking the design and representation process directly with fabrication, whereas in the level of perception and representation, it follows the aftermath of folding in architecture and its claim for a new continuity based on the abolishment of the traditional spatial dipoles (interior/exterior, up/down et.al.). In a broader sense, this shift towards the surface of things as “the deepest side of the world” has to do with a wider socio-cultural change which has been triggered by postmodern irony and by the wish to “revalorize all values”. The dualities operating as the founding myths of architecture have been widely reassessed by being subjected to arguments on their relative value and on the need to work in-between such poles as form and content, façade-space, man-building, building-nature, matter-intelligence, representation-reality, skin-structure, natural-artificial, object-subject etc.. In fact, new hybrid constructions and concepts have taken their place: cyborg, enhanced reality, virtual processor, information whereas the focus has been turned towards not the opposition among the two traditional poles but the possible relations and exchanges of properties between them. The above issues were addressed by architects and scholars from Finland, Ireland, Spain, Belgium, the USA, Italy, the UK, Denmark, Sweden, Norway, Turkey and Greece who contributed to the workshop by means of both individual presentations organised in two five sessions, and two keynote lectures by Kostas Terzidis (Harvard GSD) and Vana Tentokali (AUTh), and two round table workshops-discussions. Following the meeting, all participants were asked to prepare their revised and updated written contributions in order to produce the final outcome of the project in the form of the present edited volume. The five sessions are organised thematically in a way covering historical, epistemological, technical, conceptual-perceptual and natural properties of the issue respectively. The two keynote lectures are crossing this multifaceted subject in two different axis by emphasising at either the anthropological-perceptual and the technical-ethical challenges underlying the overall re-organisation of architectural knowledge and practice discussed. In that sense, they provide with a first opportunity to unify the various perspectives proposed throughout the book. Ctrl_Space Lab is a collaborative Athens based architecture platform providing the ground for a critical reshaping of the contemporary discourse by means of both design research and theory events. Its action is focused at the structural polarities identifying the identity of architecture. Hilde Heynen, Alex Reuta. 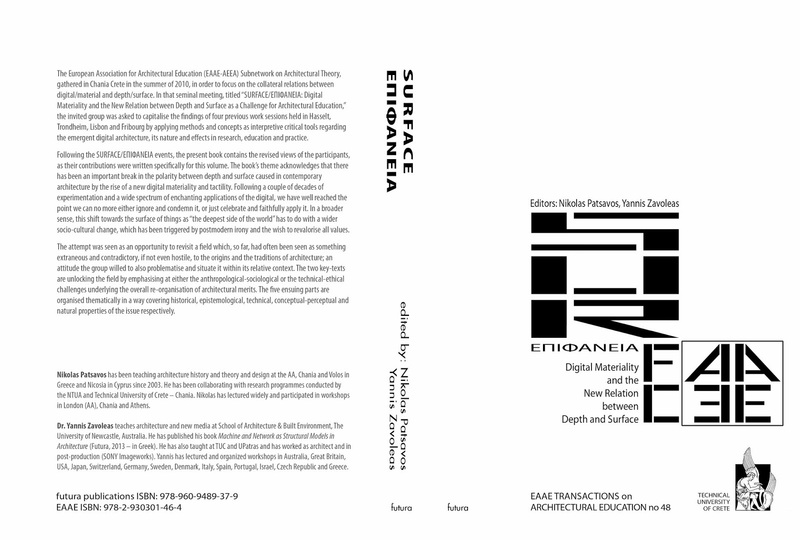 Proceedings of Four EAAE-ENHSA Subnetwork Workshops on Architectural Theory: Hasselt (2006), Trodheim (2007), Lisbon (2008), Fribourg (2009), EAAE Transactions on Architectural Education, No. 43, Brussels: 2010. Αναρτήθηκε από Nikolas Patsavos στις 10:29 μ.μ. Comments will be moderated before being published. Thank you! Ctrl_Space Lab is an architecture and design collaborative platform founded in Athens in 2012 by Nikolas Patsavos and Yiannis Zavoleas. It aims at bringing together young architects and designers in order to promote a new research based agenda for architecture and culture. Its field expands from architectural competitions proposals to real-life projects, workshops, publications and events. The structure of space, in other words the relations forming space and its perception, is being explored based on a hybrid of analogue and digital tools. Ctrl_Space Lab aims at acting as a cluster targetting the current challenges facing the architectural discourse and at developing sustainable alternatives. Ctrl_Space Lab holds a wide collection of architecture, design, art, philosophy and social sciences library which is accessible to other researchers upon request. 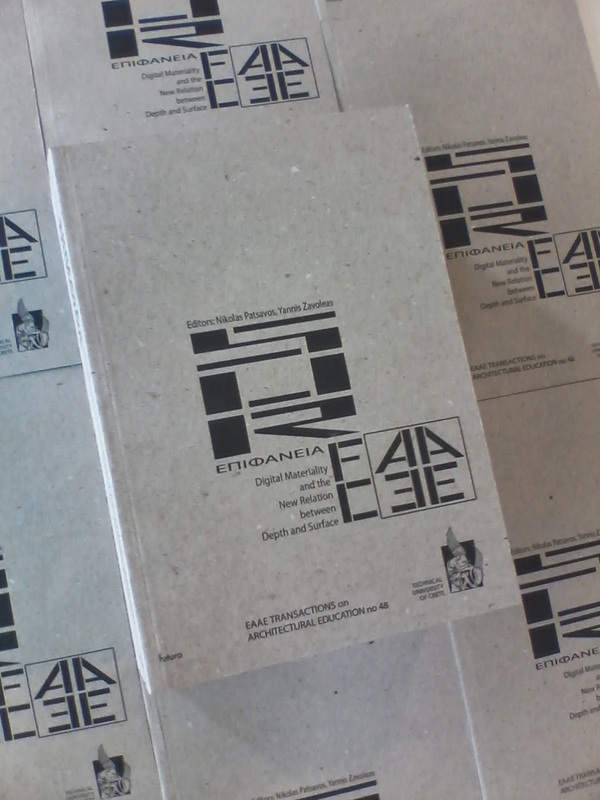 Our architectural magazines archive is donated by Elias Konstantopoulos. Ctrl_Space Lab managing partner is Nikolas Patsavos. The platform's members already include a wide array of young architects and designers in a project-based logic. A series of partnerships have been developed with the following guest or invited colleagues: Marinos Panagi, Eftihis Efthimiou, Dimitris Rotsios, Alexis Dallas, Akrivi Anagnostaki, Panagiotis Malefakis, Iakovos Rigos, Socrates Yiannoudes, Thodoris Nikolaou, Alexandros Kapsalis, Thanassis Moutsopoulos and Yorgos Rimenides. Members have been including Niki Kogkelli, Antzela Tsesmetzi, Maria Christou, Chryssa Daflouka, Gelly Dimitrakopoulou, Sofia Kontogiannaki, Chrysanthi Anogiati, Georgia Stathia, Melina Lassithiotaki, Charis Katrakis, Erato Tsatsou, Kelly Skalkogianni, Voula Panagiotarou, Vangelis Papandreou, Katerina Tsakmaki, Valia Fragkia, Stelios Theodoulou, Rania Totsika, Jenny Rigou, Aggeliki Strataki, Dimitra Mpeleri, Irene Dimopoulou and Elina Foutsitzoglou. Ctrl_Space Lab. Θέμα Παράθυρο εικόνας. Από το Blogger.